Spare bicycle parts, a restless spirit, and a willing "guinea pig" can make for a dangerous combination. 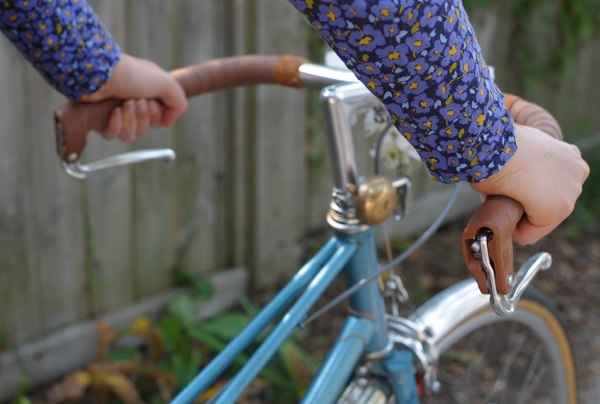 In her latest reincarnation, Marianne sports VO Belleville handlebars and Dia Compe inverse brake levers - a practice run to determine how a similar set-up would feel on the Royal H. mixte. Here are the bars and levers in all of their French glory - on a Motobecane mixte with an Ideale saddle. 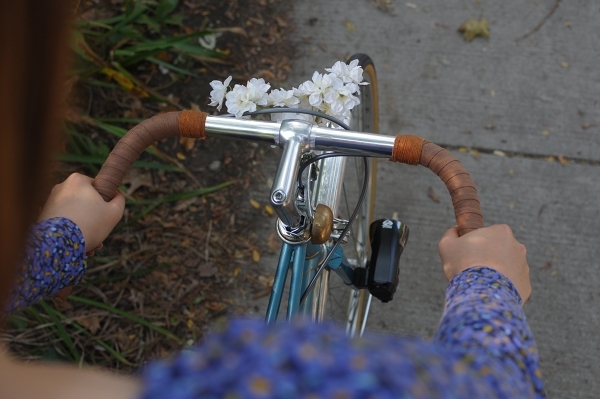 The Belleville handlebars are similar to the Porteur handlebars shown here. 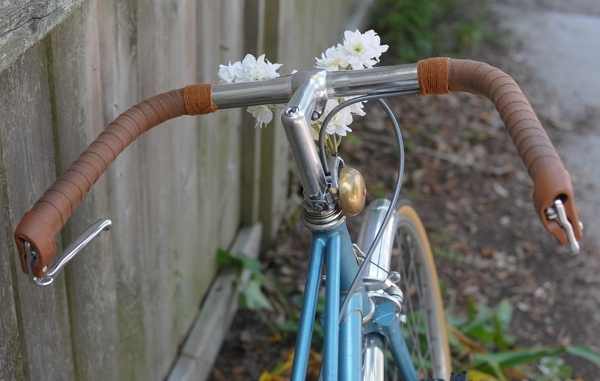 Both are a classic style of upright bars found on vintage French city bicycles. These bars are narrow, with long gripping areas that are nearly parallel to each other - placing the rider's hands in a position similar to holding a tray. The Bellevilles are 5cm narrower than the Porteurs (43cm vs 48cm) and are completely straight across the front (whereas the Porteurs have a slight forward sweep). It is typical to see handlebars like this fitted with inverse brake levers. My assumption is that this is done to maximise the gripping area of the bars. Because the levers are installed at the ends, there are no interruptions along the handlebar's surface and the cyclist is free to move their hands pretty much along the entire bar. The inverse brake levers you will find today are most likely either Tektro or Dia Compe. Here I have installed the latter, and you can see that their brown rubbery tips go nicely with twined handlebars. It surprised me to learn that some dislike the Dia Compes because of the brown tips and prefer the Tektro levers instead - which are all-metal. To me, the rubbery surface felt nice, but I suppose it is a matter of personal preference. If you have used either of these levers, I'd like to hear your thoughts. Braking with inverse levers. I have found that I am able to get pretty good leverage almost no matter where I hold my hand along the bar, with the exception of the very front. Can't brake from here, near the corners. But if I move my hands 1-2 inches back, it will work. This set-up is amazingly versatile in terms of the hand positions it allows. The inverse levers are set back from the bars far enough so that they do not interfere with the grip. You can see in the pictures that they are nowhere near my knuckles. Truly a neat design. If you are curious about this type of French set up, both the bars and the levers are surprisingly inexpensive. You will like them if you are a fan of narrow handlebars, and if you prefer to hold your hands to the sides rather than flared out or straight in front of you. I certainly fit that description, so both the Belleville and the Porteur handlebars feel as if they were made just for me. The super-wide Albatross bars were comfortable enough, but with the Bellevilles and the Porteurs I get that "spot on!" feeling. I also think that they are better match for French bicycles - especially for the Motobecane's aggressive handling. I will pause and confess here, that this is the last change I will be making to Marianne... because she no longer belongs to me. Yes, I did sell her after all - to a lovely local woman whose acquaintance I had the pleasure of making this morning. Riding the Motobecane with the French handlebars and inverse levers yesterday, I finally felt that this bicycle was "perfect" and experienced a calm sense of satisfaction - not dissimilar to how I feel when a painting is finally "finished" or when a photograph looks just right. And after that, it finally felt appropriate to let her go. I hope the new owner enjoys her as much as I hope to enjoy my Royal H. mixte - which I will most definitely fit with a similar handlebar set-up. Oh - and if anybody wants some Nitto Albatross bars (the alloy version) or VO Milan bars, drop me a line. Thankfully, I have no more "spare" bicycles to put them on. looks great, and i'm sure marianne and her new guardian are going to be very happy together! the bellevilles look great on this bike. i've used both the tektros and the dia compes. actually, i bought the dia compes for my jeunet porteur conversion, and after test-fitting them on the porteur bars, ended up returning them. i didn't care for the plastic portion, and worried that they would not hold up over years of use. whether this was warranted concern or not, i'll never know, but i ended up replacing them with the tektros, which as you stated, are all metal (cast aluminum). i was much happier with their apparent build quality, and also felt that they were a better aesthetic match for the vintage restoration i was doing, since most vintage french inverse levers were made from cast aluminum. they also feel fantastic, with a smooth, spring-loaded action guided by nylon bushings. and about that Ideale saddle--new owners? or did you acquire one ? I think they are lovely! Au revoir Marianne! Reading your blog over the last year or more Marianne has taught you a lot and helped you explore the wider world of cycling, fiddling with bikes, making changes and pushing your own limits. I think she has been a kind, generous and occasionally pushy teacher :-) and hope she enjoys her new household. Those bars with those brakes look so cool, as an aside! Like the brown with the twined bars. Very swish. I like the Dia Compe levers like these [brown ones], because they hold the cable much better, without kinking as the Tektros and other inverse levers do. Velouria, I have to say your writing is a thing of beauty. "similar to holding a tray" wonderful. Now, on to cycling! antbike has a good point-- when installing the cable on the tektro, you are forced to sort of kink the cable during installation. i thought this was sort of odd and i couldn't find a way around it. however, once in place, there are no problems with the cable kinking from use. Marianne actually *looks* complete now. Long may she roll. I hope you negotiated right of first refusal. 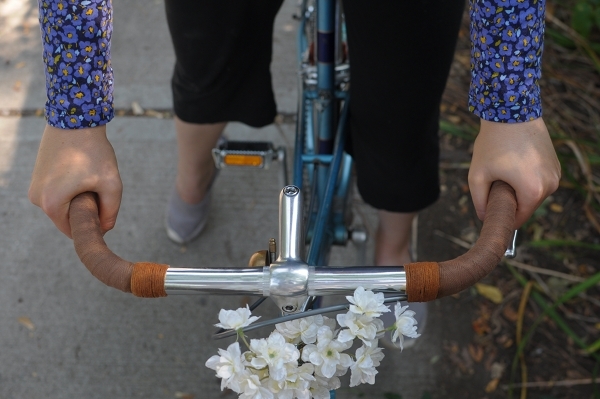 With a bike such as Marianne or the Royal H mixte, do you find that the narrow bars get in the way of low speed handling, aid low speed handling, or are neutral in their effect? I know everything comes together on M when the speed goes up. Anon 8:52 - I acquired the Ideale saddle back in the Spring as part of a trade. You can read about it here. I did not sell the Ideale along with Marianne, I still have the saddle. Au revoir, Marianne! Thanks for all the adventures. David C - Alas, Brooks leather tape is too expensive for me to experiment with! 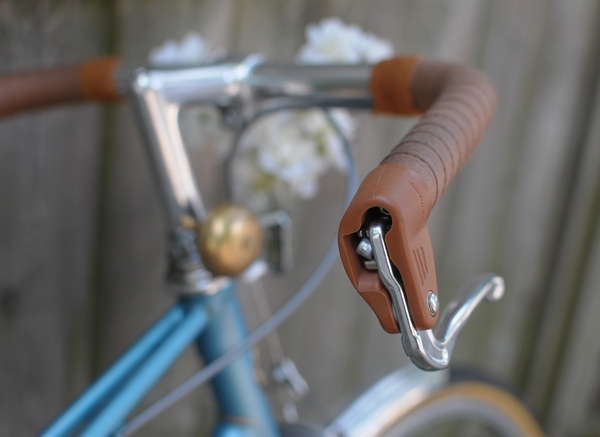 But I will attempt to install the VO Elkhide grips on the new mixte. Sounds like you are much happier with this combo and it looks so much better! I can tell already that I am going to be green with envy when the Royale H is finished. Decided on shifters yet? With apologies to Louis Malle: Lately, when I read this blog, I can't help but to say, "Au revoir, las velos!" At least you treat your bikes well and help them to find good homes. Yes, I suppose that's true! But the "au revoirs" were necessary after the many "bonjours"! I acquired the Gazelle and sold the Pashley; acquired the Trek and sold the Mercier; finished the Royal H and sold the Motobecane. But I don't think there will be any further sales or purchases this year; at least I hope not - I am exhausted! It is so exciting to see you enjoy the same exact set up as me! 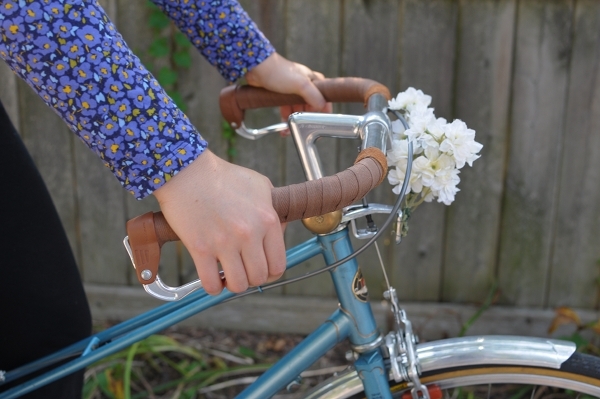 The Belleville bars have a beautifully classic look that really compliments a mixte frame. I too like the Dia Compe inverse levers and am surprised when others are bothered by the plastic. My frame is a late '70s Nishiki Olympic and the gummed plastic seems perfectly period-esque. Elizabeth--the levers have no quick release capacity, you have to rely on quick release capability in your actual brakes. You might notice one or both ends of the straddle cable blobs can be pushed-through and removed if you manually squeeze the brake calipers together. To reassemble, you would have to squeeze the calipers again. It's easier to do than to deflate/re-inflate. Some (higher-end) brakes have a lever that opens them up a bit. Um... until now I had no idea that it was even possible for brake levers to have quick release capacity, so thanks for the question Elizabeth and for the subsequent explanation MDI! handy for brakes/brake levers that don't have this feature built in! Somervillain - thank you so much for the link! I'm ordering those cable stops immediately! If you also installed a pair of cyclocross crosstop levers, you'd also be able to brake easily with your hands from the front portion of the bars. Lots of options for braking are a good thing, and silver crosstop levers would go well with the inverse ones. i just aquired a austro daimler vent noir mixte( google it, its pretty unique) i saw the mixte that you recently sold. that is a pretty sweet looking ride. why would you sell after all the work put into it? anyhow, do you have any spare parts that you may want to get rid of? specifically fenders, saddles or a small front rack? Didn't I tell you you'd never ride her? And you took me to task. Shame, shame. You just don't listen . . .
Anon 1:58 - I had planned to sell this bike prior to converting it to a single speed/fixed gear, as I was building up a new, more comfortable mixte. The conversion was merely for practice/fun and because I actually think it suits the bike better (which it does). For what it's worth, I rode the bicycle far more than (the 5 times) you predicted. 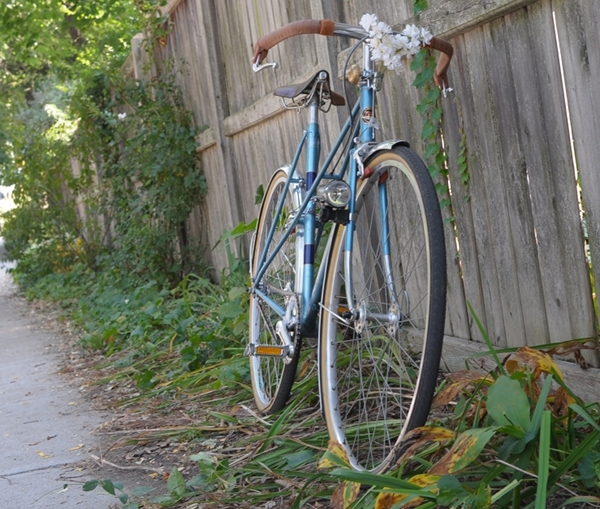 I sold it once my new mixte was finished, just as planned. Kyle - I have already sold all the spare parts. 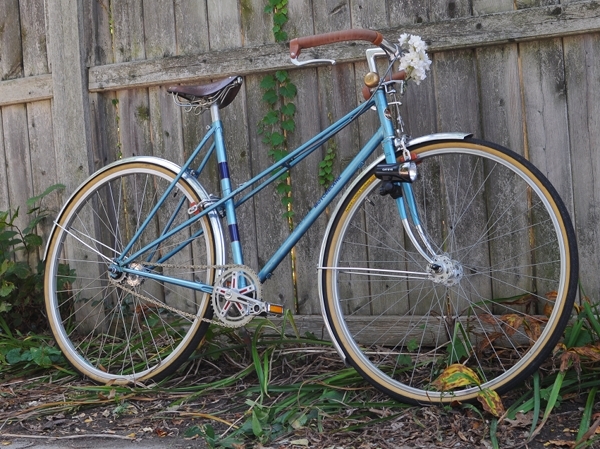 I sold the mixte because I have another that is more comfortable. The Austro Daimler Vent Noir is a pretty neat bike! 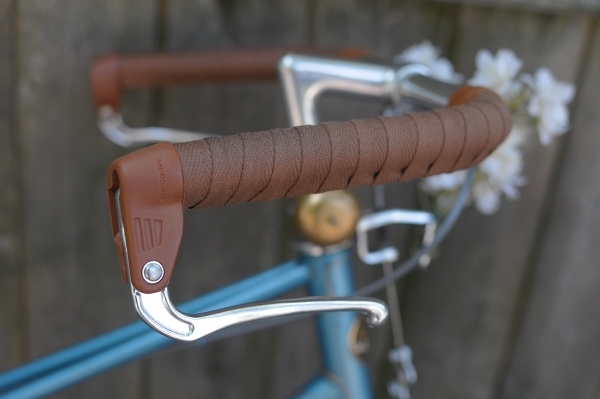 I installed the Dia Compe levers and grips on a porteur copy build. I like the looks of it and the more straight and long levers, but i don't like the play/wiggle in the levers from side to side. I regretted not ordering the tektro from VO. What bar tape did you use on the bars? 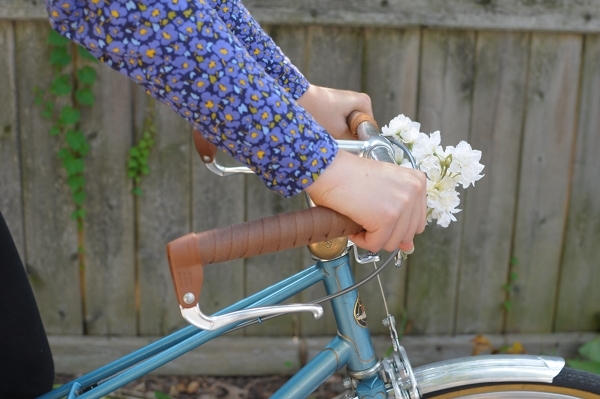 May I ask please how does one wrap handlebars with brake levers like these?